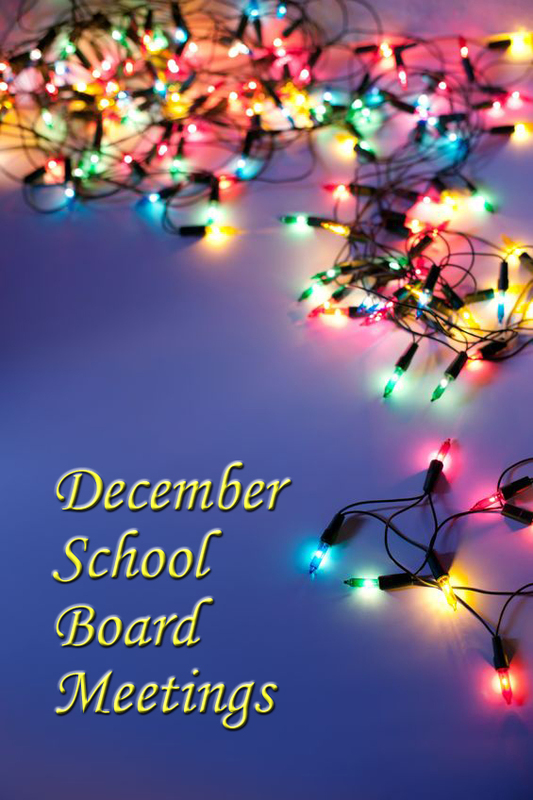 Eight local school boards met during the second week of December. Heard an announcement that Tuesday, Dec. 18, was the first day to file to run for a seat on the school board. Filing closes Tuesday, Jan. 15. The election will be next April. Heard an announcement that there will be a closed school board meeting Tuesday, Jan. 14, to conduct the superintendent’s annual job evaluation. During our audit we noted that the District utilizes computerized check signatures. Accordingly, when checks are printed they include two authorized signatures. Presently, internal controls are not adequate since the Director of Business who is responsible for performing the bank reconciliation also has access to the check stock and can print checks. The payroll clerk sets up new employees in the computer, inputs payroll information, and processes direct deposit authorization. The payroll clerk also has access to the check stock and can print checks, which are automatically signed during the printing process. The District must prepare a final expenditure report and maintenance of effort report based upon actual expenditures related to IDEA program and submit the reports to DESE. … The maintenance of effort report submitted to DESE had expenditure reporting variances when compared with actual amounts expended for IDEA related services. The District engages the auditor to assist in the preparation of the draft financial statements and the Director of Business is designated to oversee the audit services performed. We noted during our audit that the District personnel do not have sufficient experience in the applicable accounting principles and disclosure requirements used to prepare the draft financial statements. Further, the District does not have procedures to use disclosure checklists when reviewing the draft financial statements. The budget analyst and associate superintendent of business have the following accounting system permissions: approve purchase orders, add vendors, approve invoices, and print checks. Additionally, the budget analyst is the accounting software administrator and performs the bank reconciliation. … Accounting duties should be segregated such that a single individual does not have care, custody and control of District assets. The compliance requirements reflect that the District is required to maintain an inventory of capital assets purchased with Federal funds. This inventory should identify assets by its funding source and allow for ease of tracing the inventoried item to its building location … During our testing of expenditures which were funded with Federal revenue, we noted that several equipment items tested were not ordered through or shipped to the information technology department at the Baptiste location, as per the District’s procedures, so that the items could be properly recorded and tagged with bar codes for inventory tracking. Received metal detector log sheets and a police summary report. NOW THEREFORE, BE IT RESOLVED, that Kansas City Public Schools urges Congress and the Administration to amend the Budget Control Act to mitigate the drastic cuts to education that would affect our students and communities, and to protect education as an investment critical to economic stability and American competitiveness. WHEREAS, as a result of public complaints, the City has postponed the implementation of the stop signs for sixty days so that additional evaluation can be done. BE IT RESOLVED, that the Board of Directors of the Kansas City Public Schools urges the City to permanently postpone the implementation until the issue of student safety can be addressed, and asks that the City work with the Board to fully understand and take into consideration the special circumstances surrounding the flow of students, parents and buses at each school site. Several of the district’s closed school sites are in poor condition and/or have been targets of repeated vandalism. In some cases, neighborhood associations have indicated that due to current condition, vandalism, and/or lack of viable reuse interest in the sites, the surrounding communities would be agreeable to demolition. Some environmental abatement will be necessary prior to demolition and consultant services are needed to determine the level and type of abatement. The Board has two seats open for (re)-election. Thus far two candidates have filed; Phyllis Balagna and Bob White. Candidate filing is open until January 15, 2013. Since the tragedy we have worked diligently to provide support to our schools and to communicate with our staff and families about ongoing efforts to provide a safe and caring learning environment for our students. We have also provided resources for families to use in talking about this incident with their children if they choose to do so. Finally, much internal discussion has occurred and will continue in the weeks to come in an effort to ensure any systemic improvements we can make that will increase the safety of our staff and students during a crisis. This is a time for all of us to refocus on ensuring that safety procedures are known, practiced, and followed at all times. As with any tragedy, we must learn everything we can from it and use it to protect children from future harm to the best of our ability. Voted unanimously to approve a resolution to stop sequestration. Voted unanimously to spend a little more than $775,000 to purchase 51 acres on the south side of Bailey Road on which to build the district’s fourth middle school. BE IT RESOLVED, that the Liberty Public School District No. 53 will accept private funds/donations from the Liberty School District Foundation and or the Greater Kansas City Community Foundation specifically earmarked for the purpose of building and or renovating, as the District shall in its discretion deem appropriate, a District athletic/multipurpose facility. Received a safety and security update. The bookkeeper who inputs payroll information and processes direct deposit payroll authorization has the ability to set up new employees. … Internal controls should be in place to segregate duties for payroll disbursements. The bookkeeper who inputs all accounts payable checks has the ability to print a check and electronically sign the check without approval or a purchase order. … Safeguards should be in place so that a transaction cannot be electronically signed without proper approval. The District engages the auditor to assist in the preparation of the draft financial statements and the notes to the financial statements and the Superintendent is designated to oversee these non-attest services performed. We noted that the District does not have procedures to use disclosure checklists when reviewing the draft financial statements. … The design and operation of internal control procedures should permit management to prevent, detect, and correct misstatements in the draft financial statements prepared by the auditor.